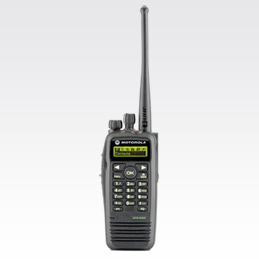 MOTOTRBO 82 series porable comes in wide range with Display and GPS feature enable, Uses Time Division Multiple access (TDMA) technology, which doubles the number of users on a single licenced 12.5 Khz Channels. Integrates voice and data to increase operational efficiency Provides clearer voice communications throughout the coverage area Meets IP57 submersibility standard along with U.S. Military Standards 810 C, D, E, and F and Motorola standards for durability and reliability Is intrinsically safe and can be used in locations where flammable gas, vapors or combustible dust may be present Portable radios meet FM approvals. .
• Operates in both analog and digital modes. Features such as the dynamic mixed mode repeater streamlines automatic switching between analog and digital calls – meaning you only need one repeater to operate both modes. • Enables a user to interrupt another radio conversation to deliver critical communication exactly when and where it’s needed. (upgradable at additional cost) . • Built-in scrambling for increased security. (upgradable at additional cost) .